Why can’t I connect to another iOS device? Apple why do you insist on ruining the look of your own products. First you made iTunes more ugly and removed full-screen album artwork, and now you have ruined the remote app by doing the same. ENOUGH WITH ALL THE UGLY WHITE-OUT APP UPDATES! This is a great app when it works. Lately it has been losing connection to libraries and Apple TV. You have to restart iPad. won’t connect to my library. most of the time my library doesn’t even show up. I’ve running iTunes 10 on an old Mac since that’s all it can support. This used to be a great way to control the tunes. Now it no longer pairs or works. Useless now. I always check out this app every few months as it always looked as if it needed updating really bad. I’m glad I looked tonight. Outstanding new UI. Super convenient, especially over going through the iOS Music app and its extra steps to accomplish the same. Dear Apple, why if I speak to my phone and say, “Hey Siri, call Corrie” why doesn’t the call go on speaker? I think it’s silly to physically interact with the phone after asking Siri to make a call. If I wanted to hold phone to my ear I wouldn’t be asking Siri to make my calls. Used the app for years without updating on my older model Apple TV. Decided to update to see what's new, and NOW it makes me select each letter in search by swiping!! The best part of using this app over the remote is the keyboard, WHYYY WOULD THEY REMOVE THAT FEATURE??! I give up. Remote app (that used to allow Apple Music/Radio control on my Mac) still does not. You win Apple. Keep this app that was once brilliant mediocre. Update Sept 18,2018 I decided to put two of our HomePods together to act as a stereo pair. Setting that up in the home app was easy. The problem is that I cannot see the newly created stereo pair to play music to! I went to my computer and clicked on the airplay devices and it’s there, but IF it connects it takes about 30 seconds to start playing. I checked ALL devices (2 iPhones on iOS 12, iPad 11.4.1 and iPod touch 11.4.1) and there’s no option to select stereo HomePods in this remote app. I also unpaired the HomePods and created the stereo pair just to be sure and issue persists. I’ve long given up on the ability to control Apple Music from the Mac through this app, but please fix this issue Apple. By the way, in the Music app on iOS devices, the option to play music to Stereo HomePods is there and connects nearly instantly. iTunes (from all computers NOT the remote app) takes about 30 seconds to connect and play. Great, now it looks like an app from this decade, but it still has the worst navigation ever. What is the point of a remote if you have to drill down three or four levels to get to the play, pause, skip, and volume controls? Still no controls to add to up next. Nothing to easily shuffle. It does connect and control my iTunes, but as a “remote” it is the biggest piece of junk Apple has ever created. It must be to try to get us all to switch to really really expensive airplay 2 speakers. No thanks. I have my iTunes running on a laptop hooked up to speakers. This lets me use my iPod as a remote. I set it up in maybe 2 minutes. Thanks! This used to operate flawlessly until Apple updated it. Won’t connect half the time to my iTunes library on my iMac. Like others say it’s grayed out. Please fix this. So much for “it just works”. Won’t ever connect to my iTunes. Both my pc and phone are on the same network signed in to the same Apple ID. No firewall. We need to be able to create and update rules for custom playlists from within the app. It’s been 10 years. Time to step it up. When I tried using the remote with my PC, it would never work. I recently purchased a MacBook Pro and was expecting it to work without a flaw, but it still does not work. I go to input the code to sync up and it says incorrect. How is that possible? Step it up guys. This problem has been persisting for a long time and nothing is being done to fix it. Loved it but . . . . . . . .
Used to use this app all the time, but now it won’t connect to my computer when I tap on my library. Would love a fix for this. This app used to be great, when it was first introduced and for years after, but it wasn’t updated to keep up with iOS updates and gradually stopped working. The recent, long-overdue update seemed promising, but as with so much else these days, Apple botched it – the app is now plagued by constant connectivity issues that make using it utterly exasperating. (Often, I can get it to play ONE SONG by turning home sharing off and back on; then it loses the connection and can’t find the library until I turn sharing off and on again.) Experiences like this are one reason I’m seriously considering abandoning Apple altogether, after using their products since the late 1980s. The days when Apple software could be relied on to “just work” are a distant memory at this point. Either the latest update for this or macOS has broken something. It no longer connects consistently. I have to login my Mac to restart iTunes each time. Please fix! Controls songs streamed from iTunes to HomePod. Apple, thank you! Works a treat with HomePod for those of us who do not subscribe to Apple Music. This new update consistently drops connection to my iTunes library. It’s very frustrating & I would not recommend updating! Keep the older version! Although I downloaded this app few years ago, and not sure why I didn’t use this, but When this can remote control my Mac after click the codes, the touching is still so strong, brilliant Apple. Constantly crashes. After hours of waiting on the phone with Apple app support I am switching to google. Completely killed my apple home set up! Ever since I update me it won’t connect to the new version of iTunes on my computer. Please update! When It Works, It’s Nice! Fix this, Apple. I used to use this all the time. It never works. I’ve used this app for years and generally been happy with it. Since July for whatever reason, (iOS updates I imagine), it is worthless. It never, ever recognizes my library. I’ve done every troubleshooting step possible, restarted router, signed out, deleted app and reinstalled, nothing works. This is quite a big disappointment. It worked for a while on my iPhone 6S, but now it doesn’t, iPad Air version has been unusable since this issue started. Possible risk of an accidental projection of vacuousness notwithstanding, what’s the point in this app? From the description, I’m getting that I can access my iTunes contents and wirelessly connecting to either speakers, Apple TV and/or a computer containing iTunes. I can already access iTunes and it’s contents via, well, the iTunes app. I been connecting to wireless speakers and headphones almost daily well before I even heard of this. I’m on a 6s I think and even it can cast to Apple TV or connect to iTunes on computer without this. Works Like a Charm... if it works at all. This is the most functional interface. I would prefer if the iOS music and podcast apps were like this. I have been using in my Home with Apple expresses for many years. Set up so each family member can listen to music in any room in my house. I have a server and 16 room distribution amp. Only grip is without Siri I have to manually choose music. I drive alot and used voice/bluetooth in my car for over 10 years (yes you could do this 10 years ago prior to CarPlay!). I would love to use an Apple TV, but Apple also removed digital/analog out from TV (I have a first generation Apple TV which I guess is now a brick). Can’t argue with the simple approach to this app. “Remote” fits my usage of iTunes perfectly. I prefer to use this type of interface when using apps, no mouse or keyboard needed here! I’m loving this on my iPad Air 2. I use it nearly every day since it came out in 08. Why, OH WHY did you get rid of the dark theme for a bright white one with no option to switch it back????? I have my whole household go to my computer and use the play close of my music but needs support for Apple Music! I literally don’t even know where I last put my Apple TV Remote. I use my phone, solely, and I am very happy with it. I am excited for the new updates, but it’s been working smoothly for years. Using the Remote app can only be described as a thrilling life-changing adventure unlike any other you’ll ever experience. While earlier versions of this app were sorely lacking, the most recent update is nothing short of breathtaking, setting a new standard not only for iPhone apps but for all software on all past, current and future platforms. I can confidently say that this update will go down in history as the most brilliant, visionary piece of software ever conceived, the likes of which we will never see again. Works how it’s suppose to with a couple of silly things that’s annoying. First, the visual style is that of something you give to a first grader learning to read. Second, the upgrade makes finding something harder than is should. This has always been one of my favorite and most used apps. It works great for controlling my home media system. This latest update is a very welcomed refresh that improves the interface making it more intuitive and pleasant to use. Nice new icon but nothing works anymore. No longer a Apple TV Remote?! I would use this app as a backup if I misplaced my Apple TV remote, and it worked great. I would open the app and my Apple TV box would be the first thing to show up. I’ve searched the app but I can’t find it! Sure, I can stream stuff from iTunes to the TV using the app, but this is not the same. If the TV remote function is still embedded somewhere in the app and I can figure out where it is, I’ll change my review. Still no radio station support! A big part of our Apple Music libraries are the stations we create to enjoy. Yet the remote app STILL ignores this category. You can play any song in your library or select from random “internet radio” stations. Yet we still cannot start playing any of our custom radio stations based off songs we love or more! Why???? Add this functionality and I’ll gladly update to 5 stars! STILL (after years) not fixed. I give up. Remote app (that used to allow Apple Music/Radio control on my Mac) still does not. You win Apple. Keep this app that was once brilliant mediocre. Nice to see the Remote app get some love! Been a long time coming. The interface is cleaner and the app more responsive now. I’ve been using this app for many years to control the audio around my house. Very glad for the update. For years it seems this app was on its way to the graveyard of apps that Apple won’t maintain. With version 4.4 (released June 2018) the app got a breath of life with an all new look and a lot of bug fixes which makes it useful again. One of the best ways to remotely control your iTunes library (especially if your computer is connected to external speakers). This app combined with an ITunes Library and airplay kicks the snot out of any Multi-Room audio solution. Period. I first started using this App in 2010 and have loved every minute since. I use it every day!!!! First off, I thought I would write a review since all the others are at least 3 Year’s old. Now, this app is amazing, if not a little tricky to set up. If your phone screen times out when setting it up, you have to restart both iTunes and the remote, otherwise it will say incorrect passcode. I have only tried it with three Macs, all working as of now. I haven’t tried with windows but I’m sure it has a similar setup process. If you get past setup, this app works great! Plus it works anywhere within Wifi range. Wow! Finally, and still no support for Apple Music? I really hope that in the next update you’ll add this support for Apple Music to the remote app too. Not including this in iOS is Apple’s excuse to release terrible UI that looks like a bad ripoff of the Music app. Why is there still no Remote on the Lock Screen? Why can I see pixelation when I drag icons when editing the menu bar? Why are the ratios of UI elements different from Music? With macOS Mojave, it means my late-2011 MacBook Pro isn’t supported. It was supported under High Sierra. My question is: is having a Mac with macOS Mojave required to use this app? Also, do you recommend that folks who have an older Mac not beta test for public beta? Why is this not updated?? Does apple feel like no one uses their Macs to play music?? Or do they thing we have home pods now? This app is not updated for iPhone X or Apple Music. You cannot have the speaker output button(airplay) and volume control in a place that can only be found AFTER you choose a song and AFTER the song starts to auto play. Whoever designed this obviously has never used the app or used the app to control multiple outputs that require different volume settings for each output. You have to put the airplay button somewhere before the music starts to play. This will blow up someones headphones and/or speakers if you have multiple setups and are not extremely careful. This MUST be fixed. Honestly, the app is as the title says. It began as a really good app. I enjoyed being able to control my iTunes from anywhere in the house. However, now, it rarely connects. I’m forced to use Home Sharing. Even then, if I leave it for too long, it seems to forget that I’m connected and then won’t reconnect. If it gets all the bugs worked out, it might be worth while. iTunes Remote 4.3.1 on iOS 11.4 always loses my Library via Home Sharing. I have to turn off Home Sharing, turn it back on, and login. Why does it go away? Why is quality level for this app so terrible? Why haven’t you fixed it in over a year? Why isn’t it updated for iPhone X? Did you forget to discontinue this app and just think it’s funny when people report issues about it? The real joke is this app. It’s clear apple hasn’t cared to update this app in years It’s not optimized for iPhone X, doesn’t have any capability of searching on Apple Music if it’s not in your library already, and frequently needs to be re setup to work This app alone makes me want to switch back to Spotify which has a much better system for controlling the desktop app from mobile. For classical music users at least .... Remote should display CD title and the artist on the iPad screen! Spotify allows users to choose music on their iPhones to play on their MacBook, and that’s what I thought getting this app would do, but it only lets you use music you’ve downloaded. I’m paying for Apple Music waiting for this feature when I could just get Spotify. Waiting patiently. This app no longer connects to iTunes. The button for my library is there but just goes gray and doesn’t connect. Used to work great. Why doesn't this work with Apple TV 4? This is just a remote on the iPhone - may as well just use the remote that came with the Apple TV. This app serves no purpose whatsoever for Apple TV users. Now they'll just move on to some other promise and get everybody excited, but won't actually get it to work. I have a remote app for my Yamaha receiver that shows me the settings, gives me channel and track information, lets me select artist, album and track, etc. All without having to stand in front of the TV like I do with the Apple Remote. What a huge failure. ***Update*** These missing features that had worked on the Apple TV 2 are now available for Apple TV 4 in the Music App. 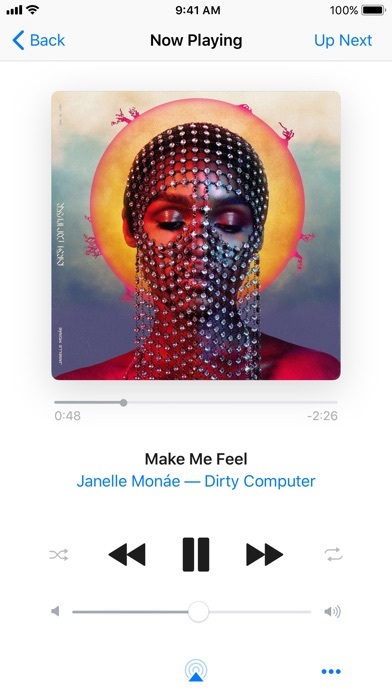 It is now possible to control the Apple TV 4 Music app by browsing and selecting your music on the iPhone without having to use AirPlay. Thanks Apple for addressing this in the correct way. The "What's Playing" tab there is no Album Art. Plus, there's not some sort of indication within the list of the Playlist of songs as to what song is playing; this used to be there. Plus, it’s time to update this app for iPhone X!! Now when you go to another app and then return to this one, it just flashes between screens. You then have to kill the app and restart it. That gets really tedious. Stupid morons screwed this up, too. You used to be able to pick a playlist and tell it to play. Apparently the idiot developers thought that was too easy, and came up with some convoluted method to add to a running play queue, Apple decided they need no input form users and just change things for the sake of changing them. i’ve gotten it to work and connect to my apple tv sometimes, and that’s great when it works. but all other times it takes forever to connect and then doesn’t stay connected (even if i turn on the “stay connected” option) or doesn’t connect at all. It crashes every time I touch the scroll bar to replay a portion of the song or audio book. This used to be a great app. Now it's buggy as hell. I can no longer fast forward or backwards without the app crashing. Come on Apple, what the hell? You have done better. It is unfortunate that they won’t update this app. Still works but it’s buggy and not even formatted for the new phones. The app doesn’t remember playlists if you change computers. 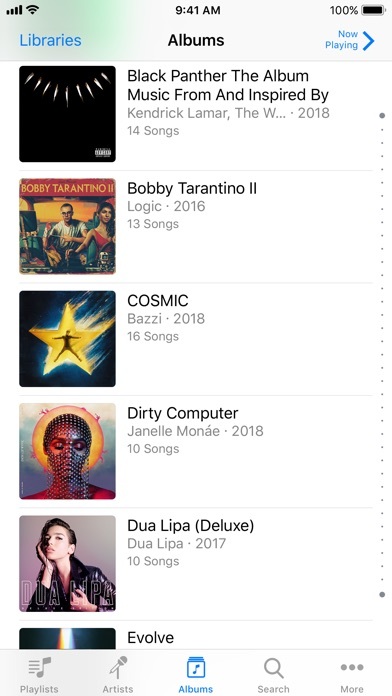 It also has no Apple Music function so If I want music to play from my speakers instead of my phone I can’t unless I create a playlist with that content. Amazing how it can be so bad. I even updated my iPhone se to the latest latest version, but still won’t download, just tells me cannot download at this time and to retry. Cant move songs around,a button that should randomize the next list soes nothing, and cant pick more than one song when adding more. Appleuaic just needs a remote feature built in. How about optimizing it for iPhone X? Did you guys forget this app? Remote control music streaming from your Mac to HomePod. I should be able to add a song from the Now Playing screen to a playlist. 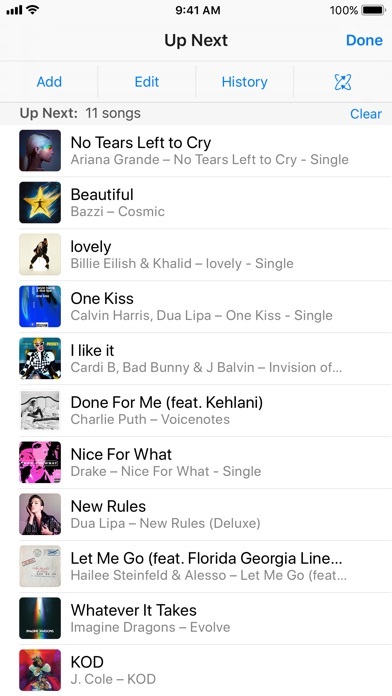 In order to add songs to a playlist currently, you have to choose the playlist, hit edit and scroll through however many songs is in your library (8000+ for me) find the song and manually add it to a playlist. Overcomplication of a simple native task. Please include the “...” option or something to the “Now Playing” screen that allows for song editing/playlisting. 5 star app otherwise. Don't even bother with this app. I have used this app for at least five years to control iTunes on my Mac. I have not had any problems and works great for me. As the title says. Update the iTunes remote app to support iPhone X please! Please update for iPhone X. It is getting a bit ridiculous that Apple still has not updated this app. Also, the Apple Watch user interface would be much better if the play and pause buttons are disabled while scrubbing, so you don’t accidentally toggle them while scrolling. It works sometimes, which isn’t good enough. Also wish it provided the ability to edit song information, like ratings. This app could be way better if Apple actually cared, but they don’t. Like iTunes, Apple has completely abandoned this app. It seems worry switching to Spotify. They have a much more fluid ecosystem. Worked fine for years. It just stopped working yesterday. So frustrating! I can control both apple Tvs & computer. Couldn't be any easier!! Thanks I use on it iPad & iPhones and iPod and couldn’t be happier. Did you just solicit me to turn on notifications in an essential apple app that I can't delete?? How DARE you. Seriously. Don't spam me in a service I pay for!! Latest version is almost perfect. They fixed a few minor annoyances I had with previous versions. I’ve been using this for years to play music out on the deck and love it! My only gripe is that I have to tune in Apple radio stations from my PC. On the app, I can see the song that is playing and even the next song coming up. I just can’t tune to different radio station from the app. Yes - they ruined it. Please just fix it! I’ve been using this app almost since it first came out (seems like 10 years or so). It used to work great! I use it to control my iTunes library through Apple TV and my iPhone 7s when I am hanging out in my pool listening to my outdoor speakers. But now, I am lucky if it stays connected for 3 whole songs. I am constantly going back into the house and monkeying with the ATV to get the connection back. It’s infuriating. Please just fix it so it stays connected! I go onto the app after My Windows computer has iTunes open, and it doesn’t find my library. The newest update absolutely ruined the app for me. I can’t connect to my library anymore without unplugging my Ethernet cord. Please fix!!! I see no improvements. The look is what annoys me. The prior version had the album cover create a nice background over the screen. Now a glaring white. I hate it. This app used to be semi good and useful. now it’s a flop. it won’t connect at all. I have restarted my phone, as well as my laptop, nothing. F L O P. Apple you had one job and it was to not eff up this app yo. Often no longer connects to my remotes. Often loses connection. Was a great product. It’s simple. Turn on home sharing, connect to the same network, login to the same icloud & watch it work. I use this constantly to change songs on my computer connected to the speakers from my phone when I am in bed. Love this thing and basically replaced remote desktop for me. Thank you for making it so easy to control iTunes remotely. Synced instantly with no problems. Controls music and volume in iTunes. This app is amazing when it works, and awesome for controlling appletv. I like it because you don’t have to point it like you do from the regular remote...I like to pause my shows from the bathroom with it! But it is moody and sometimes it just doesn’t want to work for a week. There’s no rhyme or reason to it. I don’t make any changes and it comes and goes. Has historically been a nice remote. But latest version the volume control no longer works. Other controls work fine.